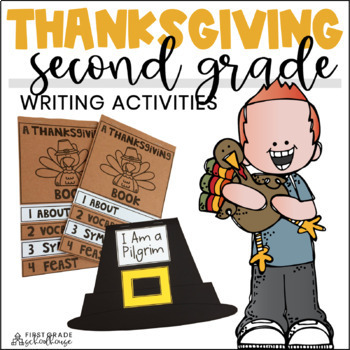 Thanksgiving Writing for Second Grade is filled with November writing activities with a Thanksgiving theme. Students write Thanksgiving stories, facts, and booklets, complete graphic organizers, respond to literature, etc. Activities and topics include a Thankful poem, Pilgrims, native Americans, turkeys, traditions, Thanksgiving feast, and more! Use the printables for a writer’s workshop, at a thematic writing center, or for independent and guided writing practice. • Thanksgiving KWL Chart - write what they know, want to learn, and have learned as students learn about the Thanksgiving holiday. • Write a List! – draw pictures and write a list of Thanksgiving writing ideas. • It’s Thanksgiving! Main Idea/Details – complete a graphic organizer by writing a main idea about Thanksgiving and details to support it. • Learning About Thanksgiving – write, illustrate, and share information about the Thanksgiving holiday. 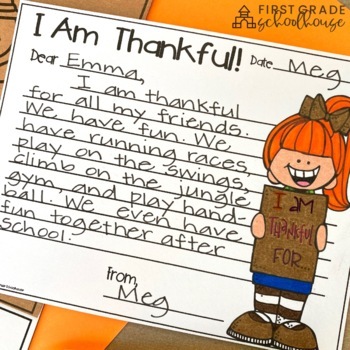 • Thankful Letters – write an “I Am Thankful” letter telling what you are thankful for or a ”Be Thankful” letter telling why it is important to be thankful. • A Thanksgiving Story – write and illustrate a Thanksgiving story. • How many words can you make from the letters in Thanksgiving?- make words from the letters in “Thanksgiving.” Write sentences for 6 of the words. • What can you write about the Mayflower? – research and write about the Mayflower. Illustrate the writing. • Thanksgiving Colors – complete the sentences about the colors associated with the Thanksgiving holiday. • Writing About Native Americans – draw and write about native Americans. • Pilgrim Life – write about what life was like for the Pilgrims. Illustrate your writing. • Thanksgiving Parade – write about a Thanksgiving parade. • Compare and Contrast Pilgrims and Native Americans – complete the Venn diagram by drawing and writing what is the same and different about Pilgrims and native Americans. • Disguise a Turkey – draw to complete a disguised turkey. Describe your turkey. • Thanksgiving Nouns, Verbs, and Adjectives – write a list of nouns, verbs, and adjectives that describe Thanksgiving. • Read a Thanksgiving book. – write and illustrate a summary of a Thanksgiving book. Evaluate the book. • Retell a Thanksgiving story. – draw and write what happens at the beginning, middle, and end of a Thanksgiving story. • A Thanksgiving Story – complete the graphic organizer to answer questions about the structure of a Thanksgiving story. • A Turkey Story – write about the main idea and details of a turkey story. • Family Thanksgiving Traditions – write about your family’s Thanksgiving traditions. • Interesting Thanksgiving Facts – write six interesting facts about Thanksgiving. • Build a Cornucopia – color, cut, and glue pictures to build a cornucopia. Write about the cornucopia as a symbol of Thanksgiving. • A Thanksgiving Book – complete a “A Thanksgiving Book” with the following pages: About Thanksgiving, Vocabulary, Symbols, and Feast. 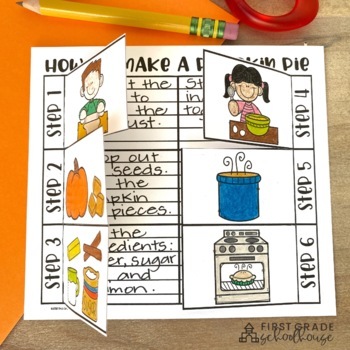 • How to Make a Pumpkin Pie Booklet – follow directions to make a fold out booklet. Write six step-by-step directions for making a pumpkin pie. • Thanksgiving Things – write and illustrate lists of Thanksgiving food and Thanksgiving decorations. • I Am a Pilgrim Booklet – draw and write about life as a Pilgrim: I wear . . . , I eat . . . , I learn . . . , I play . . . , I live . . . , and I Am a Pilgrim! • Family, Turkey, and Football! – draw and write about family activities on Thanksgiving Day. • Read to learn about turkeys. – read a book about turkeys and complete the graphic organizer with information you learn. • A Turkey Story – write a make-believe story about a turkey. • Turkey Facts – research and write six facts about turkeys. • Pilgrims – draw and write about Pilgrims. A word bank is included. • Pilgrim Facts – research and write six facts about Pilgrims. • Compare and Contrast Pilgrim Life and Life Now – write what is the same and different about Pilgrim life and life now. • The Feast booklet – cut the pictures out of favorite Thanksgiving feast foods. Describe the favorite foods and tell why they’re your favorites. • Thanksgiving Writing Paper – Thanksgiving themed writing paper for open-ended Thanksgiving writing activities. View the Preview for a detailed look at what's included in the packet. Includes graphics &/or fonts copyright Dianne J. Hook. www.djinkers.com. License #: 12169230375. Click HERE to follow First Grade Schoolhouse for updates, freebies, and notifications of new products.